The International Secretariat for Water has just launched #WaterGeneration, its new youth strategy for the next five years. For more information, visit ISW’s website. As part of #WaterGeneration, the ISW has a new project called #tonfuturtonclimat (Your Future, Your Climate). The goal of the project, which is driven by local youth groups, is to stimulate development of micro-enterprises in Togo, Burkina Faso and Benin. Check out the project HERE. 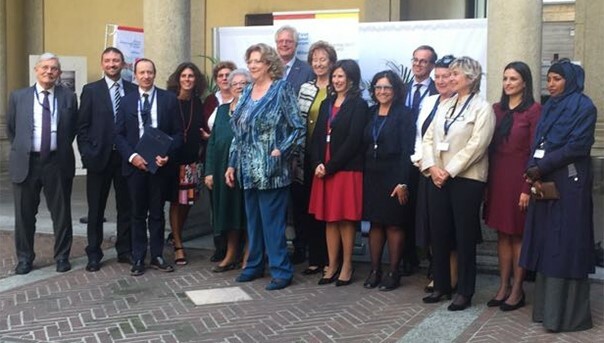 At the international conference « Rules of Water, Rules for Life », organized by the Milan Center for Food Law and Policy on the 27th and 28th September 2017 in Milano, Mara Tignino, Senior Lecturer at the Faculty of Law and Coordinator of the Platform for International Water Law at the Geneva Water Hub, received the award « Women Peacebuilders for Water ». This award marks the seventeenth anniversary of Resolution 1325 adopted by the United Nations Security Council on the contribution of women to peacebuilding in post-conflict situations. The award was given to Mara Tignino by the UN Special Rapporteur on the Right to Food, Ms Hilal Elver, and was motivated by her research in international water law and her dedication to the creation of new generations of international lawyers. On the 14th of September 2017, the Global High-Level Panel on Water and Peace launched the report « A Matter of Survival » at the Maison de la paix in Geneva. The Global High-Level Panel on Water and Peace was launched in 2015 by fifteen co-convening countries: Cambodia, Colombia, Costa Rica, Estonia, France, Ghana, Hungary, Jordan, Kazakhstan, Morocco, Oman, Senegal, Slovenia, Spain, and Switzerland. The Geneva Water Hub acts as the Secretariat of the Panel. The recommendations of the Panel tackle with the prevention of water-related conflicts and to make water an instrument of peace. It has the ambition to address water challenges in an integrated and comprehensive manner, at multiple levels, whether it is by fostering new practices, new institutions, water diplomacy or strengthening international water law. The recommendations of the Panel are also conveyed by the universal language of music. Indeed, a unique et particularly inspiring feature of the Panel’s works is that it has been accompanied and enriched by musicians from the around the world. The result has been an original Symphony on Water and Peace. This Symphony is intended to become a powerful symbol and inspiration for all efforts to make water a source of cooperation and peace.